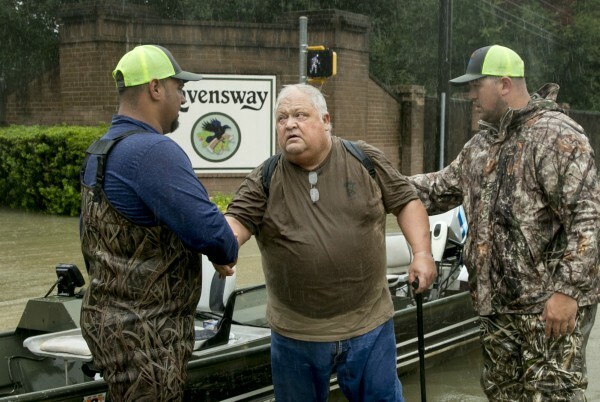 By W. Gardner Selby on Tuesday, September 12th, 2017 at 8:16 p.m.
David Emswiler thanks the men rescuing him from his flooded house in Northwest Houston on Aug. 28, 2017. Later, four members of the Texas congressional delegation voted against a plan including hurricane aid (PHOTO: Jay Janner, AUSTIN AMERICAN-STATESMAN). Four Texans representing landlocked districts fell out of step by voting against the measure containing billions of dollars in Hurricane Harvey relief that was signed into law by President Donald Trump last week. Three of the four, though, cited rationales that we’re airing out here. Their shared point: The legislation that won widespread bipartisan support was gummed up with indefensibly lousy fiscal trickery. To recap, Texas Reps. Joe Barton, Jeb Hensarling, Mac Thornberry and final-termer Sam Johnson each voted against the proposal appropriating nearly $15.3 billion in emergency aid to areas hard-hit by the hurricane that became a lingering and deadly tropical storm last month leaving behind to-be-pinned costs all over southeast Texas. The House easily approved the proposal, 316-90, and Republican Sens. John Cornyn and Ted Cruz of Texas earlier joined senators finalizing the agreed-upon measure by a voice vote. And why did the quartet of Texans vote against the grain? Helpfully, three of the four issued statements specifying fiscal reasons, as noted in news stories including Austin American-Statesman special correspondent Maria Recio’s account. Johnson did not pipe up. --Barton, of Ennis, said after Friday’s vote that he objected to the legislation as expanded by the Senate, which had amended the House measure including a smaller level of aid by adding money and folding in a short-term extension (into December) of the federal debt ceiling and tacking on a section continuing federal spending (department by department) at levels previously approved for the fiscal year that runs through this month. Barton said: "I am not against voting for relief programs to help hurricane victims, but I am against raising the public debt ceiling without a plan to reduce deficits in the short term, and eliminate them in the long term. The money we vote to spend today will have to be paid back by our children and grandchildren. We have yet again missed an opportunity for substantial reforms and reduced spending." --Hensarling, of Dallas, said in his post-nay statement that he wasn’t prepared to vote for "even more national debt without the opportunity to offset it with lower priority spending." Hensarling added: "The unsustainable national debt remains the greatest existential threat to our nation that is routinely ignored in Washington. If unabated, we will one day be unable to respond to similar emergencies as Hurricane Harvey." He closed: "Emergency spending bills must be restricted to emergency spending." --Thornberry, of Amarillo. said in his post-vote statement that his greatest concern is the legislation "forces our military to operate under a stopgap continuing resolution--once again." That was a reference to the continuation of current funding levels with no adjustments up or down. "But the world is not standing still," Thornberry said. "In fact, the threats from North Korea and others grow every day." He closed: "There is plenty of blame to go around between both parties and both the executive and legislative branches of government. But this negligence must stop. We must fulfill our duty. We must do better." If Johnson shares his reasons for his vote, we'll amend this rundown.